My new game, Lucifer's Atoms, is out now – click here for more information. AR Forum A forum that hosts competitions and discussions about Armadillo Run. 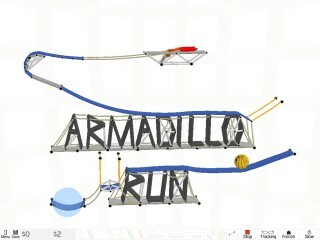 Version 2 of Armadillo Run is now available for beta testing. The physics simulation rules have been modified to fix the 'dark force' bugs, which previously allowed energy to be created from certain configurations of objects. The friction and air resistance of objects have also been modified to capture more realistic behaviour. The version 2 beta release is available to all existing customers from the download/registration link in your purchase confirmation email. You can also get to your download/registration page from here by entering your current registration code or the email address originally used to purchase Armadillo Run. If anyone has any comments about the new simulation rules please let me know so I can incorporate any changes ahead of the official release.